You could be living in carbon-neutral glory. When we think of eco-friendly building developments, we often think of buildings with a few token solar panels on the roof or a wind turbine that can barely power the communal kettle at peak times. The term “eco” is thrown around so often that it can mean anything from off-the-grid families building a home with found materials to a business installing a living wall and patting themselves on the back for their commitment to the environment. This is all set to change thanks to a new carbon-neutral building development due to be completed in 2017. 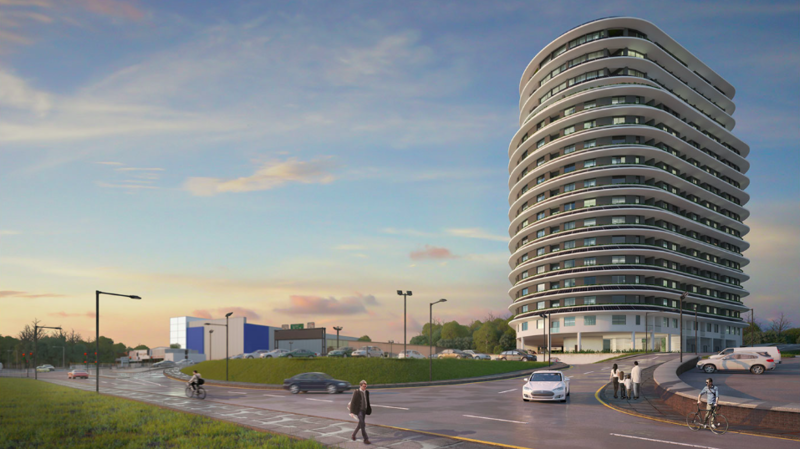 The Beacon is a 17-story development set to be thrown up in Hemel Hempstead, an area 24 miles outside of London that is in need of vision and innovation. The project sets a high green standard for new buildings in the area. We could soon see new developments vying for higher ratings in the two main environmental assmenent methods: the Building Research Establishment Environmental Assessment Method (BREEAM) and Energy and Environmental Design (LEED). Couple this with Elon Musk’s recent announcement that the Tesla solar roof will be cheaper than normal roofing, and the future looks significantly greener. Here’s what we know about the Beacon. The Beacon’s take on carbon-neutral living starts with a high density solar farm, capable of producing 0.8 megavolts (MV) on less than half an acre of land. To control interior temperature, apartments will feature triple glazing and a mechanical heat and ventilation recovery system. The building also contains rainwater harvesting for flushing toilets, and hot water will be heated using ground source heat pumps. Altogether, these features will make the Beacon the first carbon-neutral building development in the world. Residents will be encouraged to recycle with on-site recycling facilities, and they will also have access to an electric bike and car sharing scheme. The basement level will be home to a fully-automated robotic parking system. Developer Lumiere Developments has reduced prices for pre-launch sales and will help with conveyancing solicitors and valuation fees. Earlier this year, the UK government released a report that outlines potential pitfalls for developers trying to meet demanding standards for system efficiencies, highlighting some common problems with low-carbon domestic buildings. According to the report, more transparency was needed between industries to ensure lessons learned on one development could be put to use in another. The report also suggests that designers, developers, and policymakers should work in closer collaboration to ensure residents understand how to efficiently operate their homes. Complicated controls for energy-saving heating, lighting, and energy systems were to blame for some homeowners failing to make the most of their eco-friendly systems. With a Donald Trump presidency threatening to disrupt environmental protection the world over, it is now more important than ever to strengthen public interest and demand for carbon neutral or low-emission buildings.. Hopefully, the Beacon is just the first in a long line of large-scale, eco-friendly residential building projects. This is a contribution by Rebecca Harper. If you want to write for Green Future, check out our submission guidelines here. "The Beacon will save residents approximately $13,600 per year."